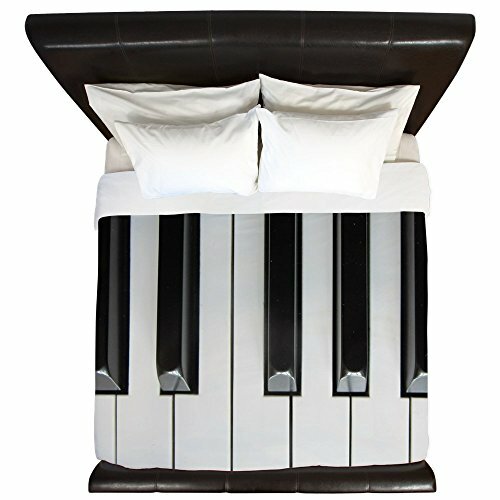 My Top Favorite Music Themed Bedding Sets for Sale! 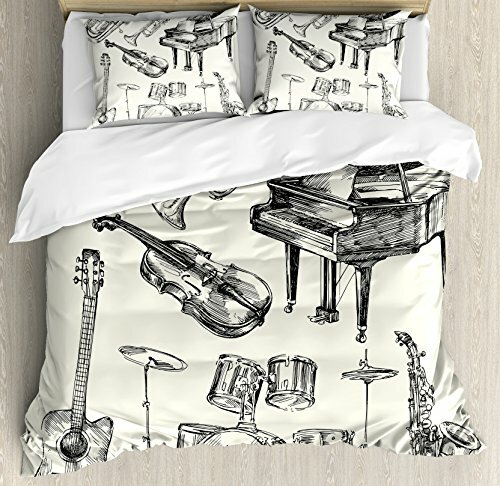 Whether you like jazz music, piano, guitar or any kind of music, I believe you will find the perfect music themed bedding set for you here! *The one in this picture is a gorgeous and very colorful pelican and musical instruments, musical notes design king sized comforter for sale! Isn’t it perfect for a jazz musician? I hope you have the most wonderful ‘musical dreams’! 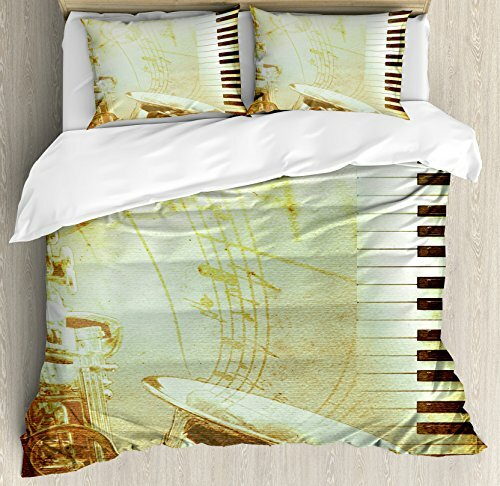 Beautiful Music Themed Bedding for Jazz Musicians! This is a gorgeous collection of musical instruments sketch style design black and beige duvet cover set hat includes the gorgeous matching pillow shams! The art is absolutely stunning! Perfect for a jazz musician bedroom who also likes to play the piano, trumpet, violin, drums or guitar! *Available in three bedding sizes. Just pick yours! 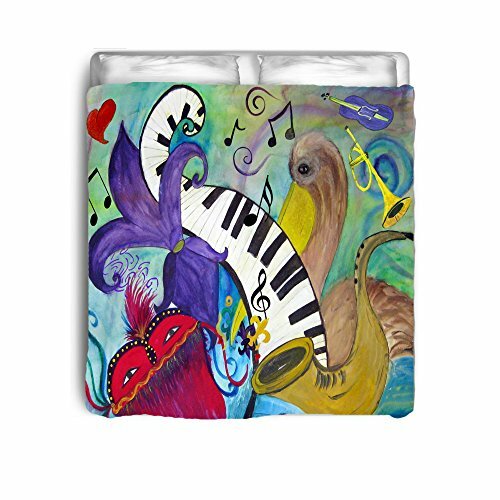 Very Cute and Colorful Music Notes Bedding for Teen Girls! Will brighten up the bedroom in a fun ‘musical’ themed way! It is also made of cotton and available in five bedding sizes! It comes with the bed sheets and the pillow shams! Very Cool Piano Keys Design Twin Size Duvet Cover! Hello gorgeous black, red and white huge piano keys! How absolutely perfect is this piano keys design duvet cover for a piano player’s bedroom? 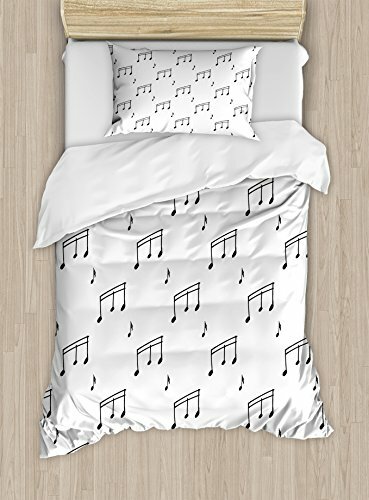 Another cool very unique musical themed bedding set for sale! This one has a cool music notes design all over! Who says we can’t ‘see’ music notes? 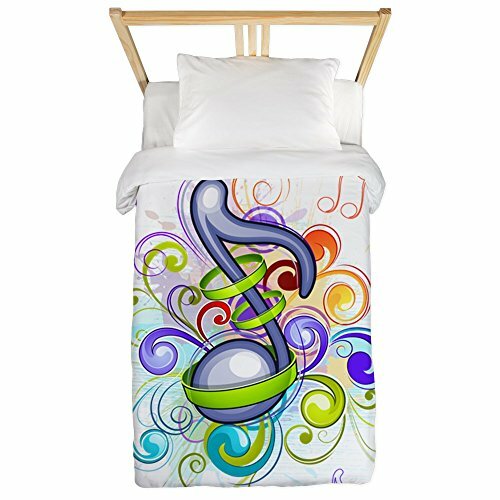 What a gorgeous and very creative musical notes design white duvet cover! 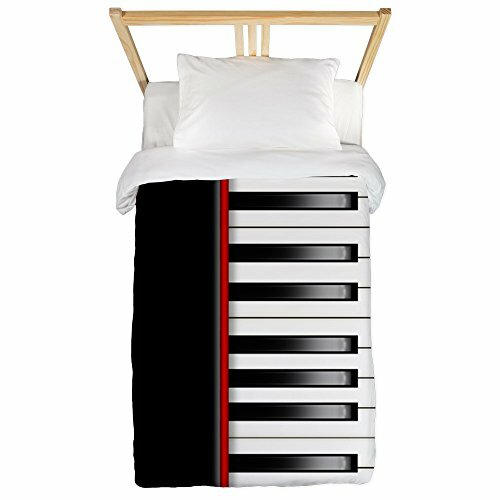 If you are looking for an awesome music themed bedding gift for a very special musician in the family, I think this might be the one? It’s a king sized duvet cover with a very cool piano keys and music notes design! Huge Piano Keys Design King Size Duvet Cover for Sale! As a keyboard and piano player myself I gotta say I almost let out a scream when I saw this stunning piano keys design duvet cover!! It is beyond musically amazing! You will definitely have the most musical dreams ever! Got a rocker in the family? Then this is the perfect music themed bedding for his bedroom! 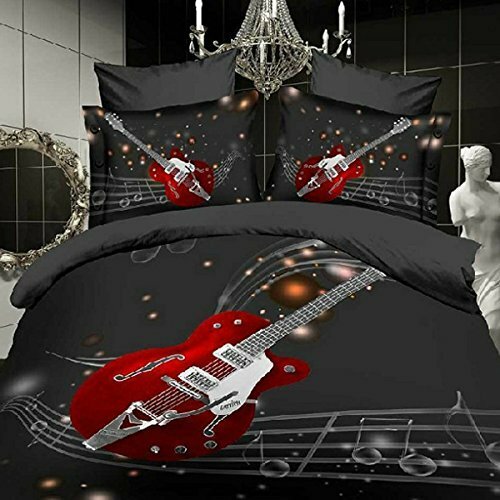 It is a fun red electric guitar design comforter set for sale! Awesome Musical Notes Design Twin Duvet! I know what you are thinking!! You want to actually PLAY those notes on your piano right now to see what it sounds like right? Red Guitar and Musical Notes 3D Bedding Set! Great Music Themed Bedding Set for Teen Boys! 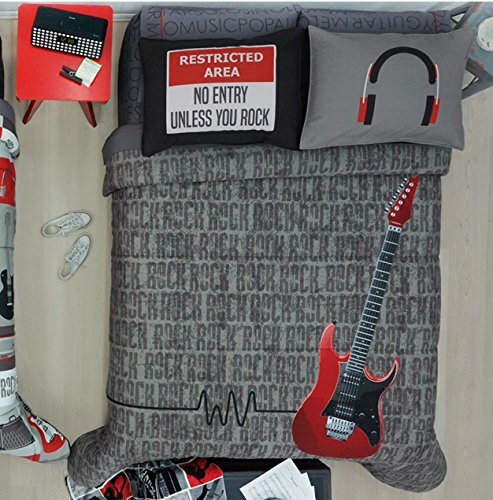 And here is one of the coolest music themed bedding set for electric guitar players! It’s a gorgeous red electric guitar and music notes design 4-piece full, king or queen size duvet cover set for sale! *For more guitar themed and musical themed bedding sets check these out too! Coolest Bedding Sets for Teen Boys! Hi Sue! I just fixed the broken link on the guitar print bedding. It’s working now! Thanks for visiting! I am impressed! I’ve been looking for music themed bedding everywhere!!! 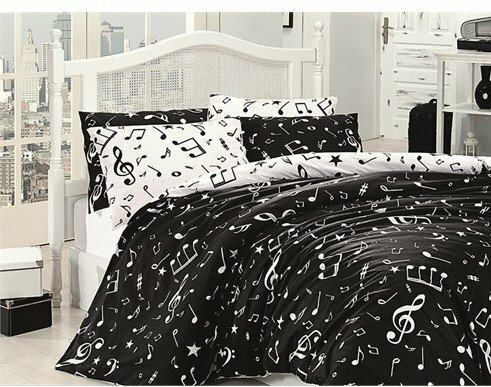 How much for a Black and White Music Notes Bedding set for King Size? You have the images above of a Queen Size.